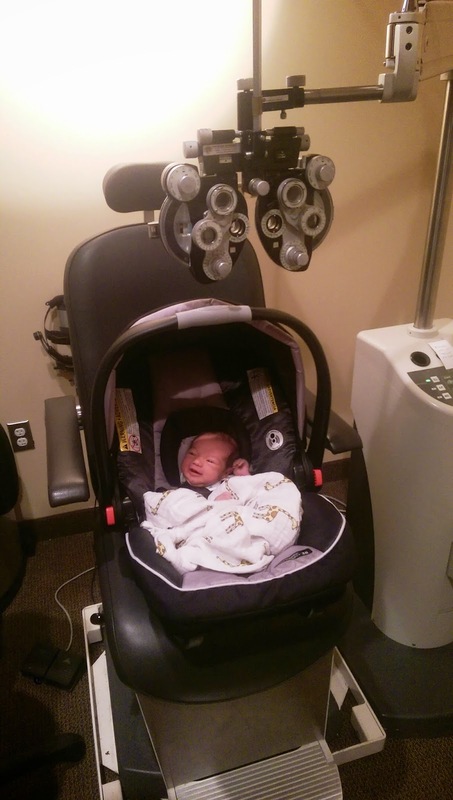 Adalyn at 5 days old "getting her first eye exam"- AKA visiting my dad at work! Optometry is something that is very important in my family. My dad has been an optometrist for about 25 years and my brother is currently in his second year of optometry school at Ferris State University. My husband has pretty poor vision and requires either contacts or glasses at all times. He prefers to wear contacts about 90% of the time and wearing contacts that are comfortable is important to him. When I first met my husband, he did not take proper care of his eyes. He would leave the contacts in overnight even though they were not that kind of contacts. He would also wear his contacts for too long past the recommendation. Since talking to my dad who is now his optometrist, he takes a lot better care of his eyes. Troy now takes his contacts out each night, usually early evening, and puts his glasses on. He properly cleans the contacts and disposes of them when he is supposed to. His eyes are in better health now than before. In fact, this may not be the cause of it, but his prescription is now less strong than it used to be! One thing that he does that he is not supposed to is rub his eyes. He gets dry eyes quite easily and has a bad habit of rubbing his eyes. Whenever my dad sees him doing this, he reminds him that that can be damaging to his eyes and to go and take his contacts out. Many people like to wear colored contacts this time of year for Halloween. It is important to remember that wearing contacts without the proper fitting from an eye doctor can cause serious risk and damage to your eyes. Besides Halloween, 17% of Americans have worn colored contacts and 24% of those have done so without a prescription. If you want to have crazy blue or purple eyes this year for Halloween, make sure you are seen by an optometrist for the appropriate prescription. -Practice good hygiene when putting contacts on and removing them. -Wash your hands before touching your contacts. -Don't wear another person's contacts. -Don't rinse your contacts with water. Use only the solution recommended by your doctor. -Take your lenses off if you have any eye discomfort, tearing, vision changes or redness in the eye. More tips and info, visit Healthy Vision & Contact Lenses. To keep track of when your contacts need to be replaced, check out the ACUMINDER® Tool.